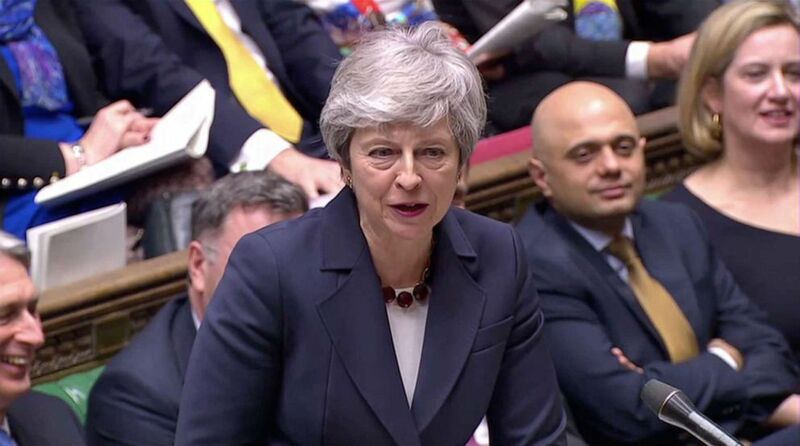 British Prime Minister Theresa May told U.K. lawmakers Wednesday that she was prepared to quit in order to deliver Brexit, as lawmakers failed to find a majority for any measure as they voted to determine alternative outcomes that would command a majority in the U.K. Parliament. May’s pronouncement came before the lawmakers voted in a series of ‘indicative votes’ to ascertain the will of Parliament. Lawmakers decided on Monday to hold these votes after May’s deal was heavily rejected by Parliament in the space of three months, which effectively means the government lost control of setting the Brexit agenda. Wednesday’s ‘indicative votes’ saw MPs vote on individual motions of alternative Brexit plans, including on leaving the EU without a deal and holding a second referendum. In the end, none of the eight motions tabled by individual lawmakers setting out alternative Brexit plans found a majority. The closest run votes were for the U.K. to stay in a permanent customs union with the EU, which received 264 votes in favor and 272 against, and for a second referendum, which received 268 votes and 295 against. 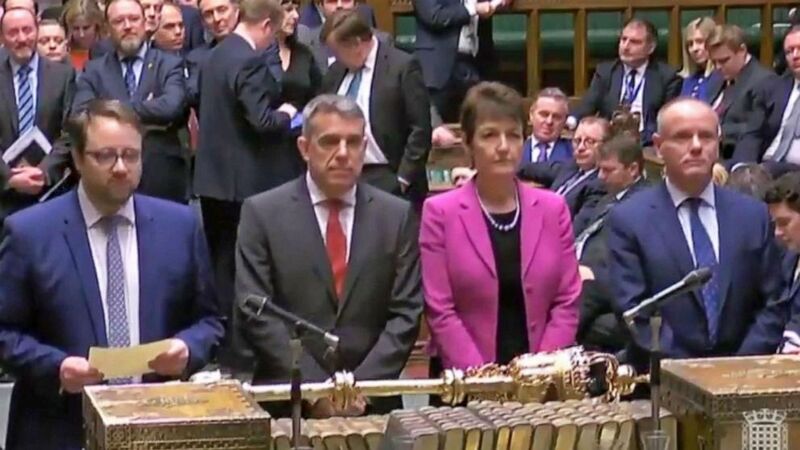 (UK Parliament/EPA/Shutterstock) A grab from a handout video shows the four tellers announcing the result of the business motion to the Speaker of the House in the British House of Commons at Westminster, London, March 27, 2019. The British Houses of Parliament are due to hold a number of indicative votes on the direction of Brexit later in the day. However, the prime minister had already said earlier this week that the outcome of the votes would not be binding and she was still determined to get her own Brexit deal through Parliament. May’s Brexit deal has come under criticism from lawmakers of all political persuasions. Some suggest that the deal will leave the U.K. too closely aligned to the EU, while others believe that the deal will damage the U.K.’s economy. May’s announcement that she was prepared to resign if lawmakers voted through her deal was made with this in mind. “I am prepared to leave this job earlier than I intended in order to do what is right for our country and our party,” May told members of the 1922 Committee, which consists of Conservative members of Parliament, according to her office. (Reuters) Britain’s Prime Minister Theresa May answers questions to Parliament in London, March 27, 2019, in this screen grab taken from video. With the deadline for leaving the EU fast approaching, announcing her conditional departure is an attempt to convince members of her own Conservative Party dissatisfied with her leadership that they should back her deal as someone else would lead the way through the next phase of Brexit negotiations. It is unclear how many MPs will be willing to change their vote after today’s developments. The prime minister’s flagship deal has already been voted down twice. The last vote on the prime minister’s deal on March 12 saw a crushing defeat of 149 votes for the government, with 242 in favor of the deal and 391 against. The prime minister’s leadership has come under increasing pressure in recent weeks. Wednesday’s votes effectively showed her government had lost control of Parliament, while last week a number of British newspapers reported that members of her own government were plotting to oust her if she did not resign. Although the original departure date was scheduled to be March 29, the U.K. recently agreed to an extension to Brexit with the EU. Now, if nothing changes, the U.K. will leave the EU on April 12. If May’s deal passes, then the departure date will be pushed back to May 22. However, May’s attempts to bring her deal in front of Parliament for a third time were dealt a blow last week when the Speaker of the House of Commons, John Bercow, invoked a 400-year-old legal precedent to say that the same deal could not be voted on again. The interjection from Bercow, who plays a major role in dictating the business of parliament, effectively means that the prime minister’s deal must change in some way in order for her to be voted on again. (Tim Ireland/AP) Demonstrators carry posters and flags during a Peoples Vote anti-Brexit march in London, March 23, 2019. 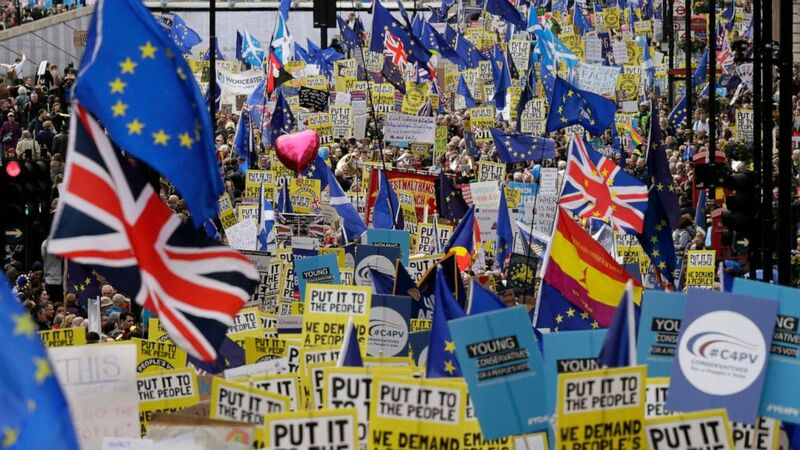 The march, organized by the People’s Vote campaign is calling for a final vote on any proposed Brexit deal. Wednesday’s developments come amid an increasingly fraught political atmosphere in the U.K. A petition to cancel Brexit and remain in the EU has gained nearly 6 million signatures, and an estimated 1 million people took part in a protest march on Saturday to demand a second referendum on the final terms of any Brexit deal.